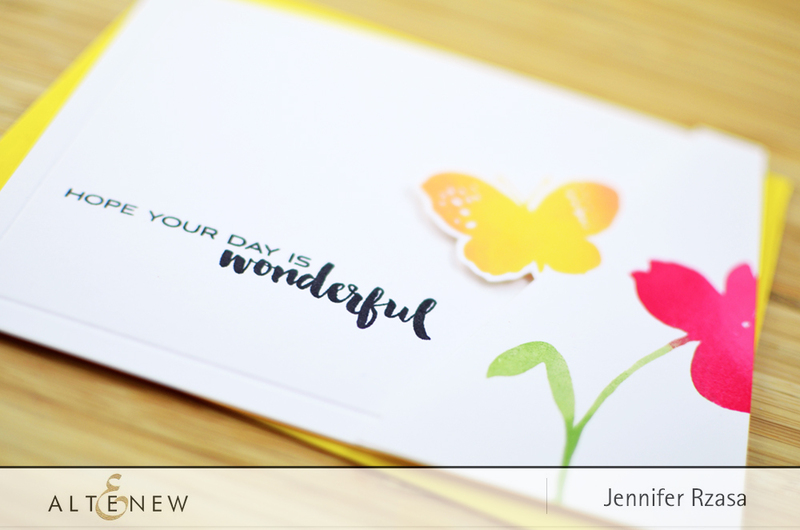 Today we have a really fun and inspirational blog hop planned for you, featuring the amazing New Day Card Kit. The New Day Card Kit is our first kit designed especially for card makers, and it includes all of the goodies you see below! You may recognize some of the elements from our Reflection Scrapbook Collection, but we also added in some other embellishments (plus a gorgeous 6″x8″ stamp set) that are just perfect for cards. Additionally, the paper pack is 6″x6″ – a favorite size for card makers. I love using kits because they help me make quick cards. Sometimes I want to spend hours creating a masterpiece, but other times I’m in a rush to whip up a card 10 minutes before I leave to leave for an event. That’s where the New Day Card Kit comes in! For my first project, I used the stamp set that is included in the kit. I stamped out the flower in Frayed Leaf, Forest Glades, Coral Berry, and Ruby Red inks. The butterfly was stamped in Mango Smoothie, with a touch of Coral Berry on the wings. Next, I cut a diagonal line through the cardstock (without cutting all the way through), and fussy cut around the butterfly. I scored around the edge of my card base, and stamped a sentiment in Jet Black ink. The flower/butterfly panel was then adhered with foam tape onto the card base. We hope that you get inspired by the projects created by our design team and guests. If you think you want to join in the fun, now is the perfect time to purchase the kit. 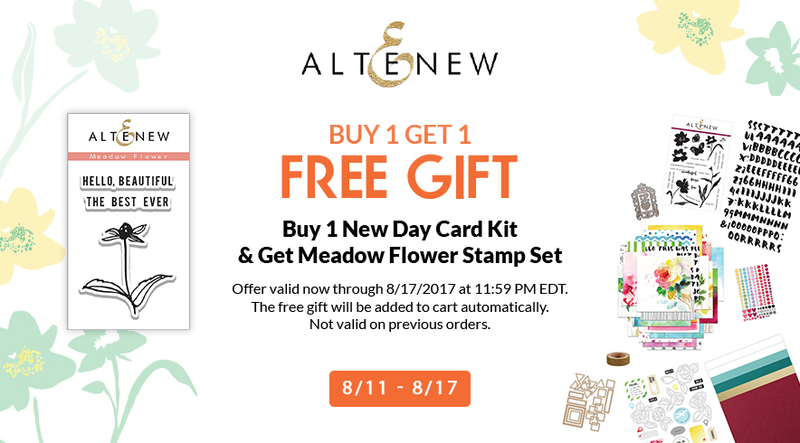 From now through August 17th, you will receive a free Meadow Flower Stamp Set with the purchase of the New Day Card Kit. To celebrate this blog hop, we are giving away a $50 gift certificate to THREE lucky winners! 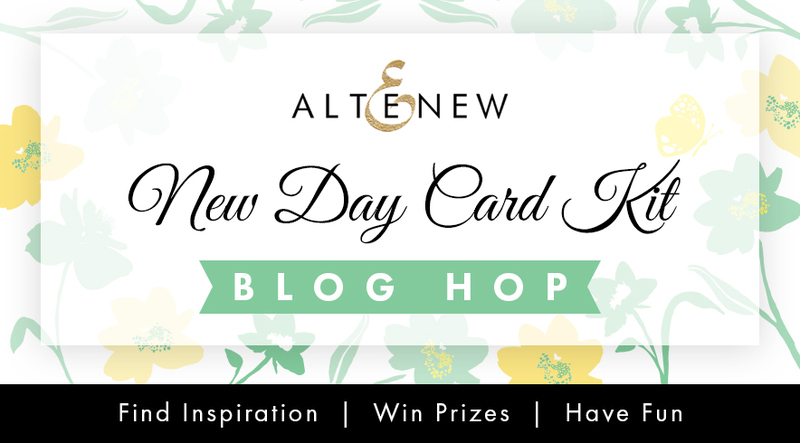 Please leave a comment here on the Altenew Card Blog by Thursday, August 17th at 11:59pm EDT for a chance to win. The winners will be announced here on Saturday, August 19th. Nice kit and beautiful cards! There is an amazing and fabulous card design with this kit.. i wish to have it..
I’m saving for my FIRST altenew stamp set. I’ve seen the most amazing cards made with your products and CAN’T WAIT to start creating with them! Wish your company all the best!! 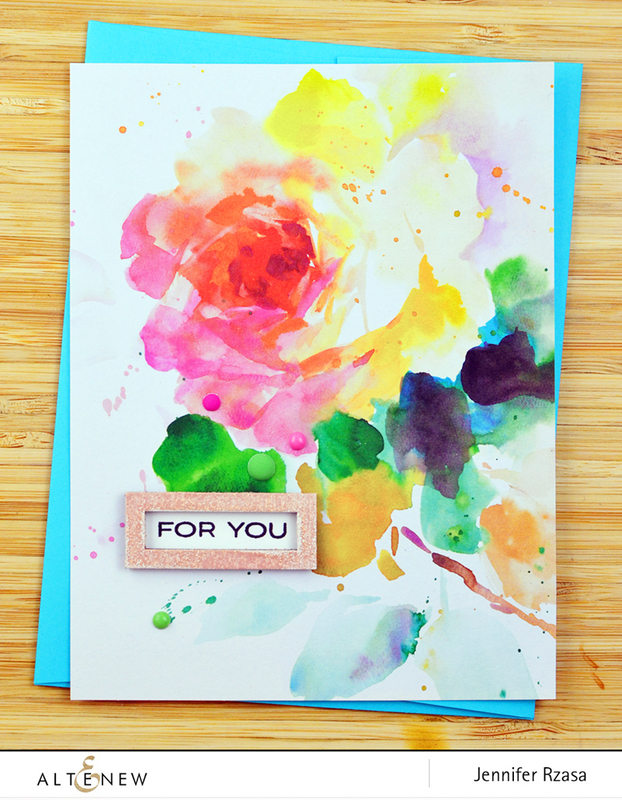 Beautiful watercolor rose card and the kit looks fabulous. I love the beautiful colors. I would be over the moon to win one of these kits. Thanks for the giveaway. Amazing colours and so unusual second card! What a great kit. So much to play with. Really love this kit. I Love Altenew stamps. This card kit is just amazing. Thank you for an amazing kit. I have loved your stamps and this is the first kit I have purchased. All the products are beautiful and will help build my Altenew stash. Your stamps are beautiful. I discovered your store from watching Vicky on You Tube. You have some very creative designers! What a fabulous array of gorgeous papers, stickers, and unique dies–there is so much in this kit!! What beautiful cardstock. Lovely kit. Amazing kit and gorgeous cards! A rocking kit and rocking inspiratioN! This kit is amazing. I love the pattern paper and the stamp set. Such a happy kit! The colors are gorgeous, and the stamp set is elegant, and the frame die is adorable; and the blog hop artists…so creative. It’s a beautiful kit. Well done!! What a stunning kit! The papers are to die for…I love it! Wow, I love those papers, especially the rose one used by Jennifer. I like what Vicky did with the patterned papers too. I’m yet to delve into Altenew stamps, but seriously thinking about the New Day Kit now. My only gripe – Australia is cut off on the map paper. What a delightful kit! My favorite is the frame die, have been looking for one of those! And such pretty papers! Wow…this card kit looks amazing! Such beautiful items to work with…I especially love the watercolor look panel. Gorgeous! What an a cheerful, elegent card in the hop.. easy but amazing one.. Such beautiful stamps you have and this kit – amazing!